Bavaria is known for its beer, which is brewed in accordance to purity law tradition established in 1516. That love of beer permeates the culture, so we’ve planned a visit to two different breweries. From Garmish-Partenkirchen, we take a leisurely one-hour drive to the Reutberg Monastery, which is known for its beer making. The monastery is located in the small town of Sachsenkam and is surrounded by farmland. At its large outdoor beer garden called Klosterbräustüberl, we watch cattle grazing in the flower-filled pasture with gentle mountains rising in the background. German beer gardens are relaxed and casual. You don’t need a reservation, and you’ll often find families there with children. 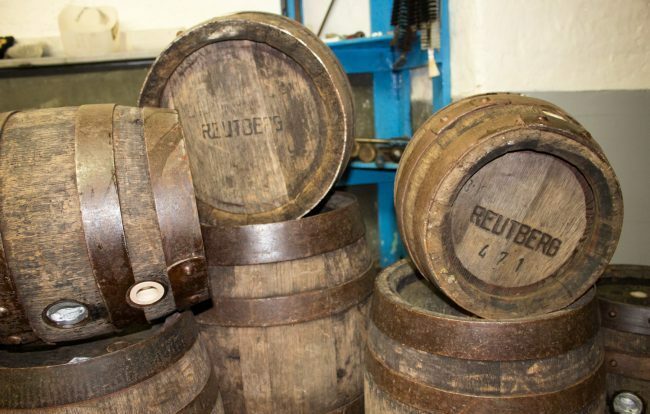 From the historic monastery, we head the car to Bad Tölz to experience the modern side of beer making in Germany. 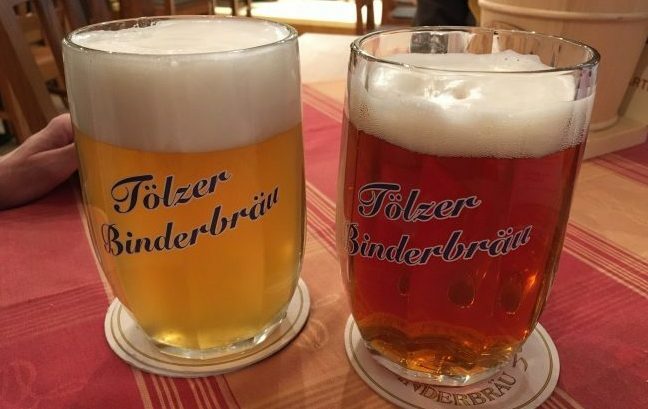 We stop at the Tölzer Brewery, where Andreas Binder and Andreas Forstner make innovative craft beers that have found a strong following. They give us a tour of the small brewery, and then we get to sample some of their creation. Benjamin’s favorite is the Braun Bier, an amber beer the brewery is trying out, and I have another Radler, this time with a dark craft beer as the base. 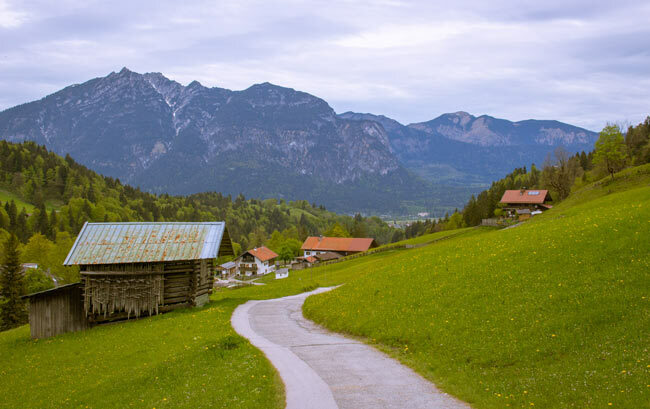 The Bad Tölz region is a popular destination for Germans who seek a place to unwind in a healthy, natural environment. We see that commitment to nature at Kräuterpark Bad Heilbrunn, a community herb garden and learning center in Bad Heilbrunn. One of the garden experts takes us on a tour of the gardens, introducing us to several new herbs. She shares how they can be used for taste and to enhance a healthy lifestyle. I hadn’t known that dandelion leaves could be used in cooking, but we taste them, and they’re not bad. There are detours on our next leg of the trip, and our two-hour drive becomes four. 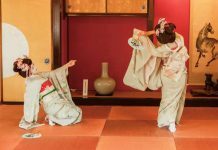 But we don’t mind, because it takes us along yellow canola fields in bloom, and past tidy farmhouses and rural villages. Eventually, we end up at the Altmühltal Nature Park, a German treasure that is little known by American travelers. Just an hour from Munich, the Altmühltal Nature Park is a protected area of 3,000 sq km, and it’s ideal for those who want an active vacation. An extensive trail system provides opportunities for hiking, cycling, canoeing and more. Benjamin and I hike part of the Altmühl Valley Panorama Trail, a 200 km path that was voted Germany’s favorite walking route in 2012. Afterwards, we drive to the nearby town of Solnhofen. The Altmühl Valley region was once at the bottom of an inland sea, and is rich in fossils. 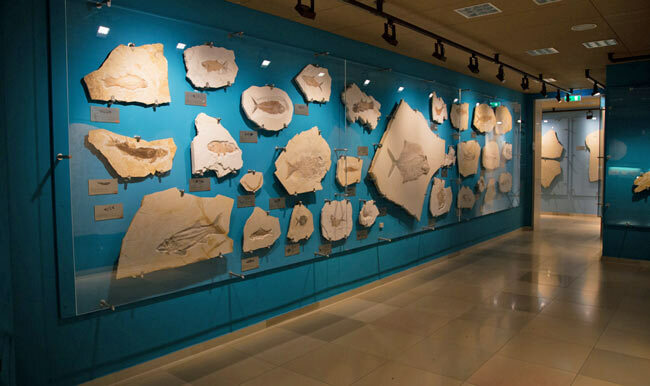 The small, but very well-done Museum Solnhofen houses an incredible collection of fossils that have been found in the nearby quarries. My favorite part of visiting this beautiful valley, though, is seeing several of its small towns. Built on rural heritage, the region is rich in farmland and is famous for its sheep. We get to sample a traditional lamb dish that evening at Zur Sonne Restaurant in the tiny village of Papenheim (population 1,500). 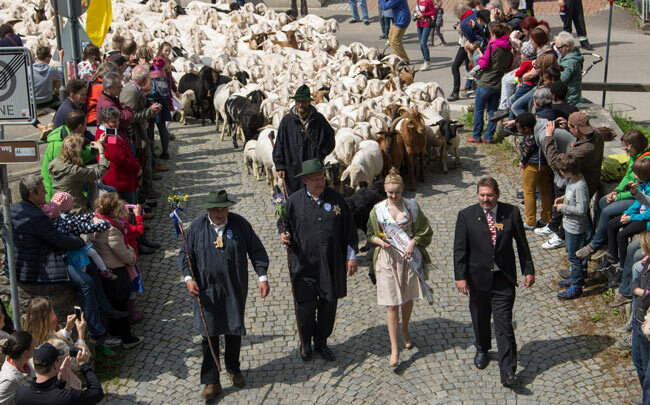 The most unusual view of the region’s sheep comes the next day when the town of Mörnsheim holds a festival celebrating the taking of its sheep into the hills for summer grazing. 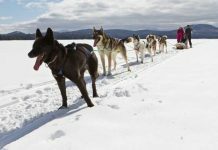 As part of the festival, more than 1,000 lambs and sheep are herded through the town’s cobblestone streets and then up into the hills, guided by shepherds and their sheep dogs. Waiting for the sheep to make their appearance, we listen to a folk band play and line up with the locals for tasty lamb sandwiches and the ever-present beer. Children jump up and down in anticipation, and I hear laughter from many corners of the town square. Finally, we hear the sound of bells and the whistle of the shepherds to their dogs. Then hundreds of sheep flow past in a wriggling wave, their bells ringing and small feet clambering loudly on the cobblestone. When the sheep have gone, we stop at a nearby stand for poppy seed strudel and coffee. Suddenly a quick rain storm appears. Everyone grabs their pastries and we run to a nearby tent with picnic tables. We crowd together – local residents, the festival’s “Lamb Queen”, members of the German folk band, the mayor, and two Americans who are happy to have landed here. As the rain pours down, the jovial group jokes around, sometimes in English (for our sakes), sometimes in German. It’s a contented moment that sums up our time here in Germany. 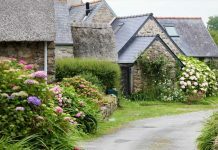 We’ve had the chance to see many small communities, places not built for tourists, but for everyday lives. And for just a short time, we’ve become not tourists, but travelers, giving some of ourselves, and taking a little bit of this place with us when we return. You can rent with most major car carriers, and most have locations at or near the Munich Airport. Be sure to reserve a GPS. Most rental cars in Germany are manual, but you can request an automatic. Most Germans speak some English, and many speak it very well. I’ve always found them to be welcoming and helpful, often with a fun sense of humor. It’s customary to say hello and goodbye to the shopkeeper or restaurant staff when you come into and leave a place of business. Don’t be afraid to smile and ask for help if you need it, and a heartfelt Danke (thank you) always goes a long way. Locals are always the best source of travel information. The German Tourism Office has a comprehensive site with tips, places to stay, what to do, etc, at Germany.Travel For information on travel in Bavaria, see bavaria.us. If you’d like to stay connected via phone and internet, consider getting a European SIM card to use in your phone. As long as your phone is unlocked, you can simply change the SIM card and use your phone with that. I used a SIM card from HolidayPhone.com. SIM card plans start at $50, and they will ship the card to you before the trip.